What should the Santa Fe arts and music scene look like in 10 years?You’re going to get a sneak peak at this coming weekend’s AHA Festival and Progressive Arts Fair, but you can get an even sneakier peak and give us your own answer at MIXED Tracks.Santa Fe Southern’s famous cocktail caboose, not-so-narrow-gauge nightlife nexus and iron horse of a DJ den–The BAR CAR–hosts this month’s MIX. Two bars, an open air flatcar and DJ PERISH on deck in the middle of the Railyard. 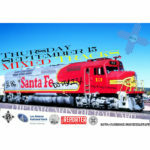 The final deadline for the Los Alamos National Bank MAKERS MIX CHALLENGE (check it out at mixsantafe.com/makers). AND the ability to ensconce yourself in a dizzying amount of rail tonnage and stay all night as the BAR CAR continues ’til late. Your passage onto the BAR CAR is paid by MIX (so long as you arrive before 8 pm. People with visions for the future of Santa Fe’s arts and music scene will be fronted a free beverage as usual and all delicious, local fare is yours for the taking.